After a little bit of drama Hana was discharged and we got home early this afternoon (Saturday). The drama involves the lab at Stanford and the Kaiser pharmacy (unrelated dramas). 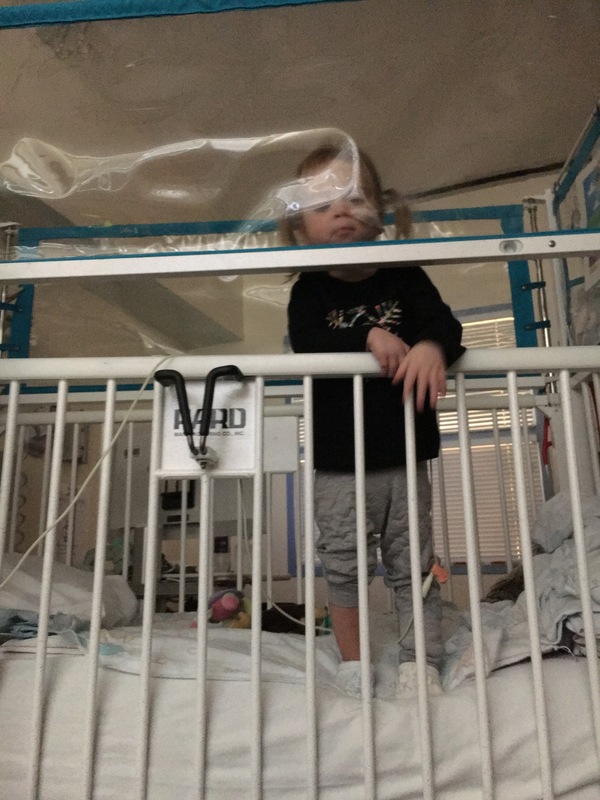 We’ve been waiting on the second negative adenovirus PCR to be cleared to stop the Cidofovir treatments and go home. Everything else with Hana’s condition was resolving or resolved. The resident was working hard to get all our discharge stuff ready so we could go sometime on Friday. She was also working with the lab to get that last test result. 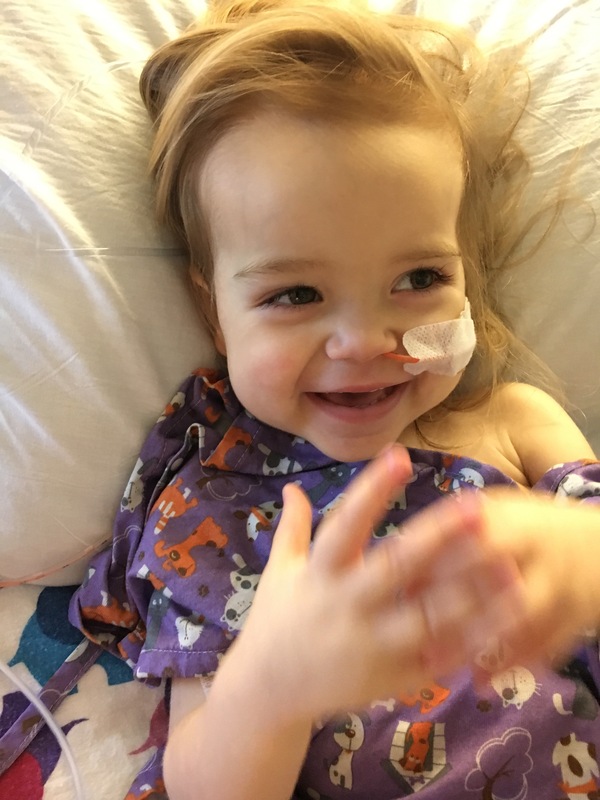 We were all hoping it would be negative, of course, and they agreed to hold off one day on her scheduled Cidofovir infusion to get the result so she didn’t get an unnecessary treatment. The lab promised a result by the end of the day Friday. After repeated calls nothing had come by 5pm and the answer we got was that whoever ran the test didn’t use enough blood from the vial that was sent and therefore they couldn’t get a result. They didn’t need more blood, they just needed to run it again and since it was already Friday end of day it would have to wait until Monday. This was obviously not okay with a number of people as it would mean at least two more possibly unnecessary days in the hospital and the risky Cidofovir treatment all because someone made a mistake in the lab. It took the attending physician to make some calls to ensure someone stayed late and ran the test again. The result came in some time after midnight – another negative! The other drama with the Kaiser pharmacy was less severe. The resident talked with someone at the Kaiser pharmacy to ensure we would be able to get three medications we needed upon discharge. Two of them were just medications that had expired over the four weeks in the hospital. The person at the pharmacy said they would be ready. The pharmacy called to tell me they would be ready that afternoon. They called Paul when they were ready to be picked up. Paul went Friday night to pick them up and they only had one ready. He was told to go to a different pharmacy to pick up the others the next day. Today our friend went to pick up the prescriptions while I packed up the room. They didn’t have what they needed to fill either prescription and gave her a hard time saying we should have picked them up yesterday (why? If they don’t have them and can’t fill them). I hate having to come up with threats and ultimatums but it had come to this. In the end they begrudgingly called around and found out Kaiser in San Francisco could fill them. We shall see if that happens. Now we are home! We ended up having way too much stuff at the hospital that we now have to unpack! Hana was cranky about leaving because I think she knew things were changing and she didn’t quite understand what “going home” was going to mean. Once we got in the car she was pretty happy and once we got home she got right to work playing with her toys and discovering the Christmas presents that she had been too sick to enjoy (she still has a few to unwrap!). She is running around the house and talking up a storm. I’m exhausted, way more than I thought, and it’s going to take at least a few days to get things settled. But we are HOME and it’s amazing. Thank you to everyone who helped keep us fed, sent cards and gifts! It’s helped tremendously. I call this homecoming bittersweet because across the country, from the hospital where I was born, my grandfather is also being discharged into hospice care at home. After a traumatic car accident eight years ago where a man was trying to kill himself by running a red light at 70mph and hit my grandfather’s car, my grandfather has battled lots of very painful and complex medical conditions. In the last week, some new problems emerged that have caused a lot of pain and their treatment interfere with the maintenance of other conditions. It’s very hard for me to digest all of this while being exhausted and dealing with Hana’s own hospitalization. It’s also really hard to be so far away especially when we’ve been unable to visit our families back east for two years. It feels really hard. I’m ready to get out of here! Hana is dealing better than me and she hasn’t even left the room in weeks. Today I’m going to start weaning the amount of iPad watching, although she does that naturally too, as she gets interested in doing more things. I’m starting to get frustrated with the state of things. The pediatric dermatologist came to look at Hana’s skin. He was concerned about the unusualness of it and so recommended a skin biopsy and additional tests. We were able to do the biopsy right in the room, about 30 minutes later. I sat in the recliner and held Hana in my lap while the nurse, resident and attending dermatologist did took the biopsy sample from the front of her thigh and then stitched her up. She did get lidocaine first and Tylenol but she still screamed on and off. About 30 minutes after it was all finished Hana was practically dancing around the room talking and laughing! Since the biopsy, Hana’s really been mostly back to her usual self. She is laughing and playing and singing and climbing a little. It’s hard because she is often attached to some wires and tubes and therefore limited. Her appetite has been good, although the variety of what she’ll eat isn’t that great. 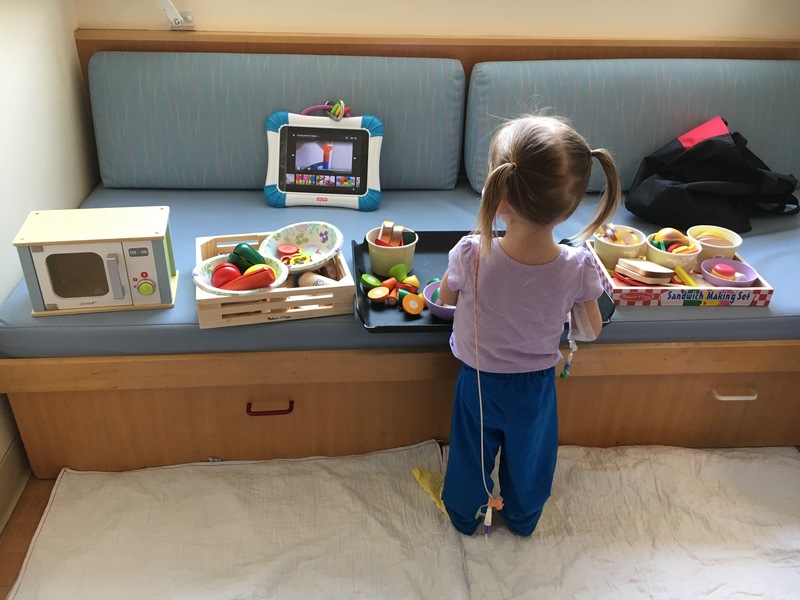 On the downside, Hana is still having high heart rates, bloating, and high blood pressure. 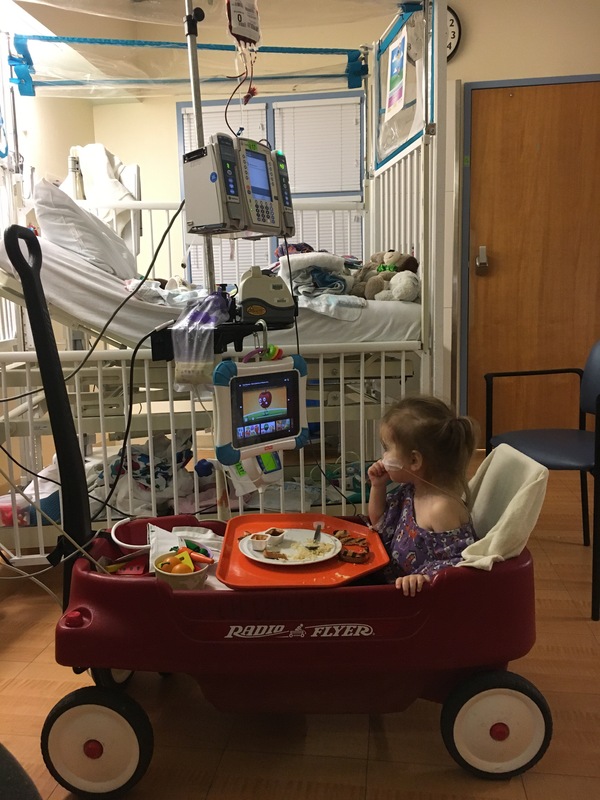 Her neutrophils count is improving and so they restarted her Cellcept. 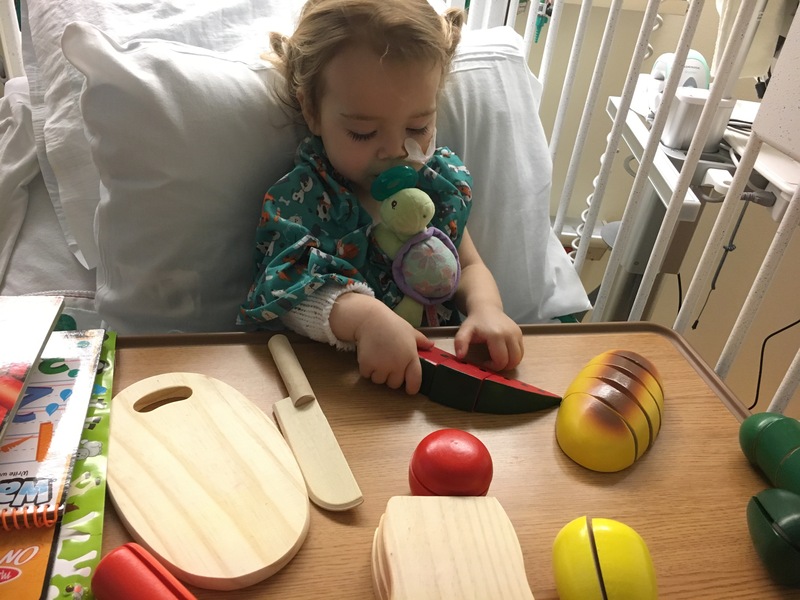 Her Tacrolimus levels have still not been stable so we need that to be working better. 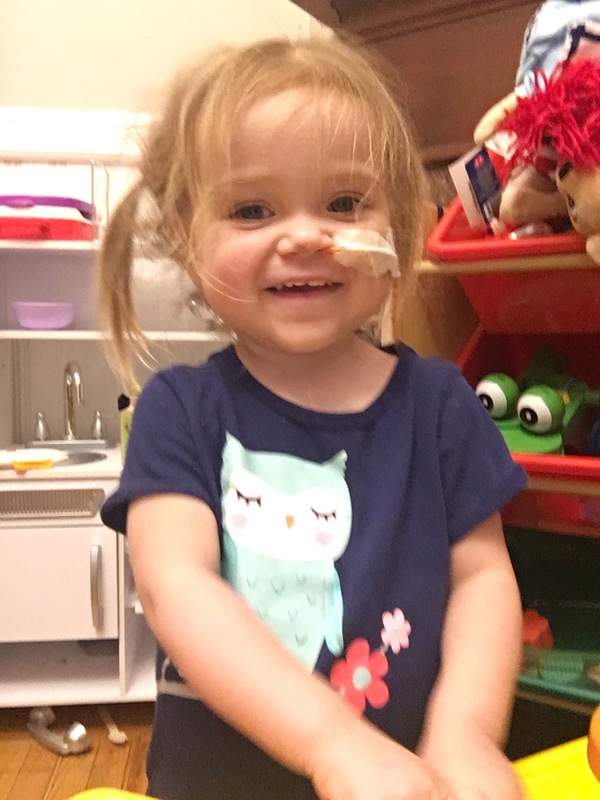 Once she is off the Cidofovir, they can restart some of her other meds, including her enalapril which will help lower her blood pressure. The pediatric dermatologist checks her skin every day. Today he said he was very pleased as her wound sites are looking much improved. It’s so weird to see wounds appear without any (outside) trauma. The skin is coming off and she is bleeding over the underlying bloody looking areas and so we have to keep them covered for now. I know they are very sensitive and hurt Hana. So far, there have not been any notable results, other than ruling out most scary things. 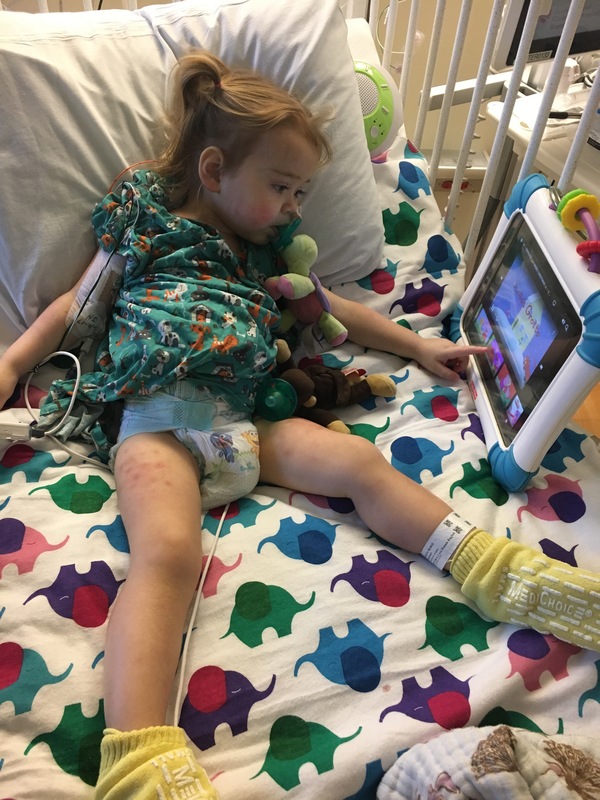 The dermatologist is heavily leaning towards adenovirus causing transient changes to her clotting which caused injury to some small blood vessels. They are going to consult with hematology who may need to get involved based on a few more test results we are waiting on. It’s very strange to thing that Hana’s blood may be clotting too much when, for months on the Berlin Heart, they thinned her blood so it wouldn’t form clots and this was never a problem. It’s still puzzling why her rash appeared over her old lovenox injection sites and where her hospital ID band was on her ankle. As I’m writing this the resident has come in to tell me that Hana’s adenovirus PCR was run on Monday and came back NEGATIVE!!!! Now we need another negative today (she, the resident, is going to see if they can accelerate getting the results) and maybe we can go home this weekend! We have now been here for three weeks! Everyone thought it was going to be two or three days. We are all getting weary of being in the hospital. The good news is that Hana is doing much better, for the most part. It still feels like two steps forward and one step back but at least that’s still overall progress. Over the weekend Hana started walking and playing around the room, not just sitting in bed or in the wagon. She’s a bit wobbly on her feet and I want her to get her strength back so I’ve been pushing her a bit to play standing up. Her mood has been better – laughing, smiling, playing and singing. Her diarrhea is gone. Her appetite has greatly improved, although still almost entirely starches. 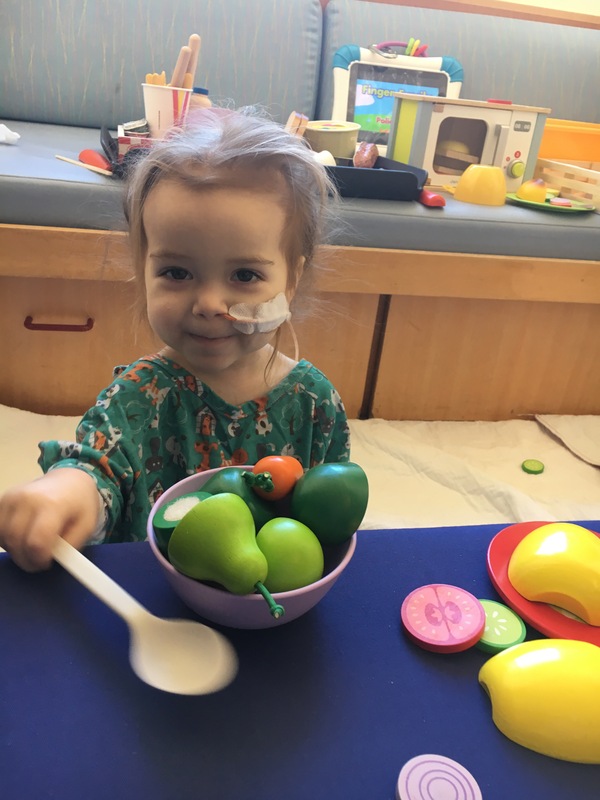 I thought I was going to have to go to battle over Hana’s NG tube feeds but the attending physician (the head of the transplant cardiologists) stepped in and reassured me that his end goal was the same as mine and in the meantime he really thinks she needs the extra nutrition. 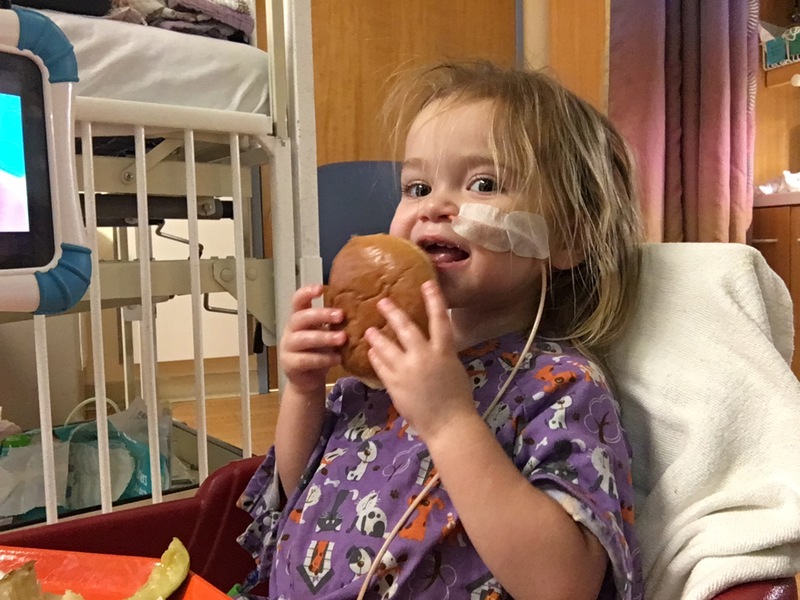 Their goal is only 50% total calories from tube feeds and I can live with that, especially since she probably needs the extra help right now. They’ve also been very willing to listen to what I think about her feed schedule and the amount of Pedialyte versus formula. I think it’s been going fairly well. Hana is still battling with a lot of bloating but that seems to be getting better. So I feel we’ve taken a bit of a step back too. Hana is now anemic from all the blood they’ve taken recently, so she is now getting liquid iron which makes you feel really terrible. We’ve started putting it in her formula mix so she gets it over several hours which has made it better but it is more iron than they typically prescribe. Yesterday Hana’s hematocrit was so low that she got a blood transfusion. 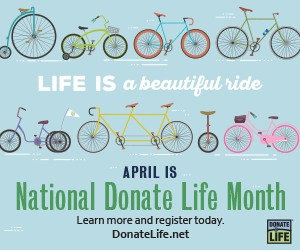 Ordering a blood transfusion is never a trivial thing for pre and post transplant patients. About an hour into the transfusion the rash that cropped up about a week ago suddenly got much worse looking. It also looks the worst in the area Hana still has lingering bruises from lovenox injections (while on the Berlin Heart) AND under her hospital ID band on her ankle. The rash could still be from the adenovirus but these latest developments are odd so now we are waiting on a consult from dermatology. Hana tossed and turned and had screaming fits all night long. I think the rash is starting to really bother her. So today we are both VERY tired! In addition, Hana’s weight is up significantly from yesterday, not a good thing. She looks swollen again, her respiration rate, heart rate and blood pressure have been high. So at this point, we have a nice list of things to resolve before getting out of the hospital. We need Hana on a good nourishment and hydration plan with oral eating and tube feeds. Her Tacrolimus level needs to be stable. She needs to restart her Cellcept and a few other meds as soon as she is not neutropenic. Of course, she needs to test negative twice in a row for adenovirus so we can stop the Cidofovir treatments and I’m thinking at this pace, she will test negative twice before we got the other things resolved! 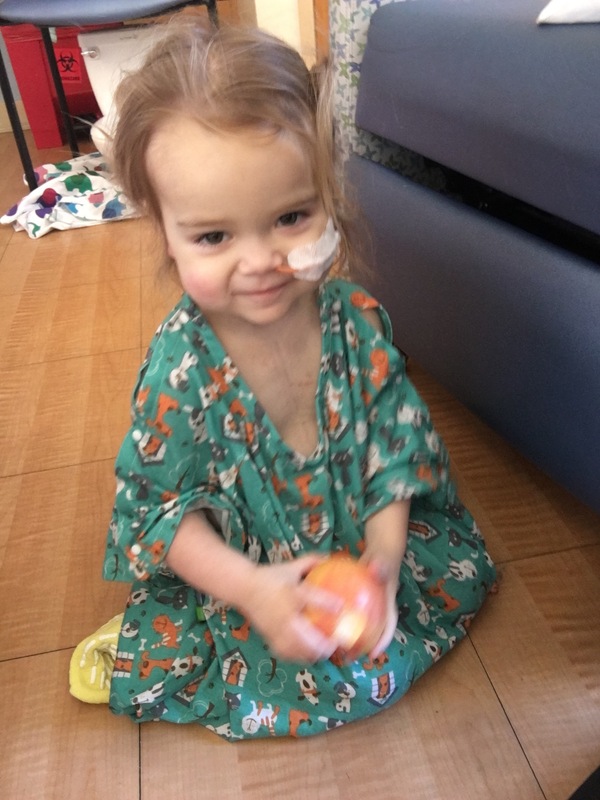 Hana’s bone marrow, liver and kidneys all need to keep up with all the extra load they’ve had to carry. Hopefully we can get her back to health without any more complications. 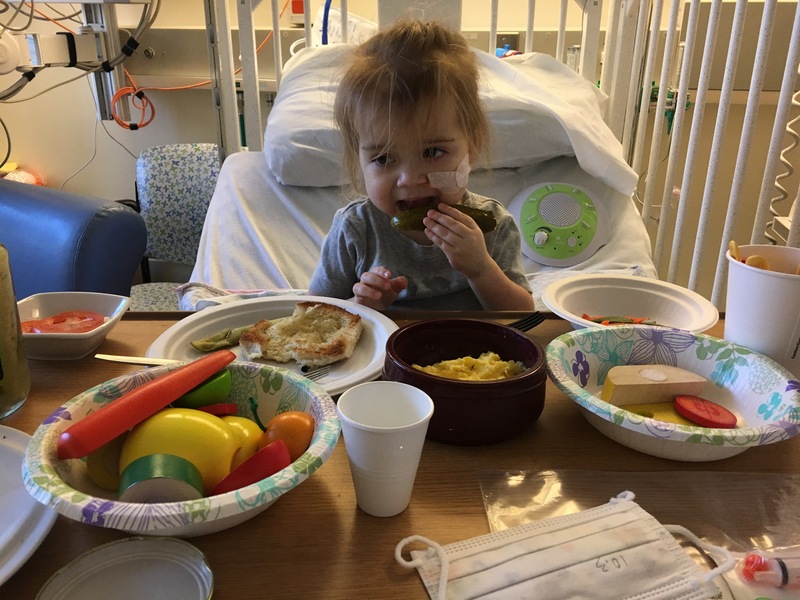 We got Hana’s adenovirus results back and they were both higher this week than ever before, in the 30,000’s. This was very troubling to us and I started to feel like maybe things were careening out of control. But I kept reminding myself that Hana seems much better, so that should count for a lot. Still, it was a bit stressful. 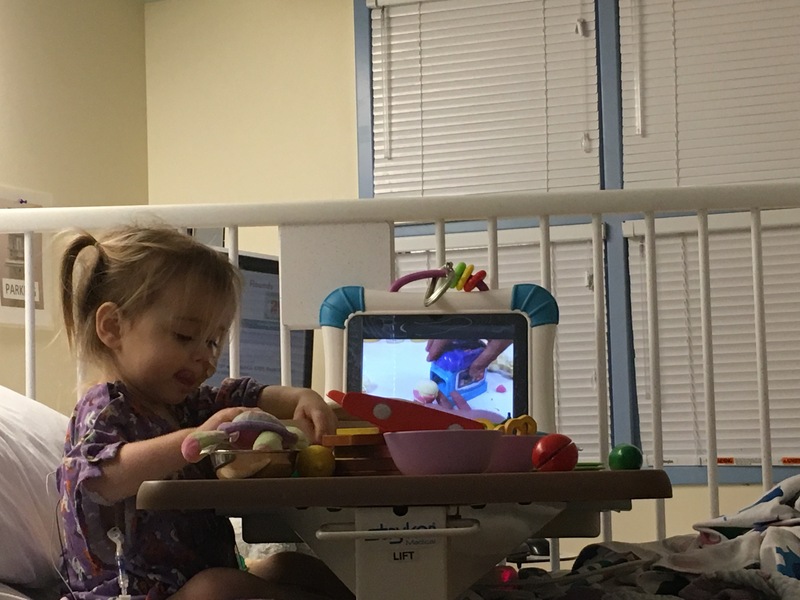 They’ve been playing with Hana’s feeds schedule since she’s been sleeping so poorly at night and I always felt she did better not getting continuous feeds overnight. When Hana sleeps poorly, I sleep poorly. The GI doctors said Hana’s digestive system is more mature so she may be able to handle things that she didn’t handle well before. So we’ll see, but I still think Hana needs gut rest at night when she’s sleeping, that’s when humans are supposed to get gut rest. Other than her half Pedialyte, half formula feeds Hana has been eating more foods. Toast, rice, noodles, carrots and crackers. Apparently pancakes do not qualify as conforming to a lactose-restricted diet so I’m not allowed to order them, despite getting the GI doctor’s approved. Today Hana had NO diarrhea for the first time in weeks. She still has tons of bloating and gas and her heart rate and respiration rate have been quite elevated. I’m hoping that she is truly on the mend. Now, getting back to the adenovirus results, the resident had already spoken for the Infectious Disease doctors about Hana’s results. They said ‘they have seen this before’ and ‘let us know if her results are still not going down after next weeks results’. So, they don’t sound concerned. They are the experts so I’m giving them a bit more time to prove themselves. They also said there is some lag time between when a patient’s symptoms lessen and when the test results reflect this and the most important thing is that she is starting to feel better. Now, this makes more sense to me. Lastly, as it was explained to me about the test results numbers, the increase from the last test result of 15,000 to 30,000 is not significant. It may sound like a lot but it isn’t and there is margin of error too. If her results went from 15,000 to 250,000 then that would be significant. This made me feel much better. Of course, I’d like the results to be ZERO. We want to get out of here! The hospital has been a madhouse lately. Now we NEED to get some rest! So the morning after Hana’s fever her mood improved dramatically. She still wakes up cranky and sleep has been problematic but yesterday (Tuesday) she actually smiled! I was so surprised. I think this was the most encouraging development for the medical team too. During rounds they discussed delaying her next Cidofovir treatment by one day so that they could look more into drug reactions. So it ended up being a quiet day with just playing with toy food and licking Pedialyte popsicles. She had no more fever or rash. She seemed in a much better mood all day and did well with playing and talking. She continues to have lots of gas and a distended stomach. Today (Wednesday) followed a very restless night of sleep. 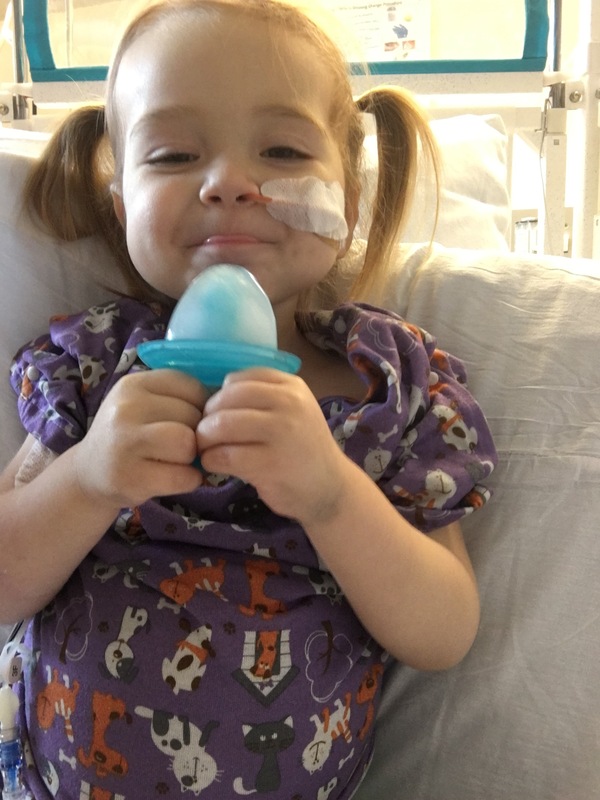 Overnight they transitioned Hana off her TPN (IV nutrition) and increased the amount of Pedialyte she got through her NG tube. Hana seemed in good spirits, relatively speaking, with more smiling, playing and singing. As the day wore on she did seem much more cranky for food. She would get frustrated with her toy food and then cry. Two GI doctors came to see her and felt it was a good time to start half strength formula/Pedialyte tube feeds. They said there is never a guaranteed time when it’s safe to start and sometimes you just have to try and test how things go. After Hana’s Cidofovir treatment finished they started her on the half Pedialyte/formula feeds. An hour after that she was crying so much for cookies that I decided to give her a cracker. She nibbled it nice and slow. Then I gave her another. Over the next three hours she ate six packages of crackers (saltines). She was pretty happy about it! Now we wait to see if she throws up or gets more diarrhea. Hopefully not and we can get out of here in the next few days or so. I know I need to get out of here and get some sleep! I’ve been completely exhausted! Yesterday (Sunday) was pretty low key and boring. Hana got her Cidofovir treatment So there was a little extra activity but nothing notable. Today (Monday) was much different. Hana woke early and cranky. She’s crying for food – pancakes, noodles, cheese. I’ve been a little worried about her distended stomach (from gas) as it seems to be a new symptom. I’ve also noticed her heart rate and blood pressure creeping up and although they are within an acceptable range it seems there should be an explanation as to why. The attending physician noticed this trend too and ordered an echocardiogram to be done today to check Hana’s heart function. In other news, Hana’s neutropenia seems a little bit better. Hana and I got busy with her toy food. I put the bedside tray over her crib and sit her up. This is probably why it took me a little while to notice the rash. She didn’t have the rash in the morning during rounds. I called the nurse who came to look. Then the resident came and looked. 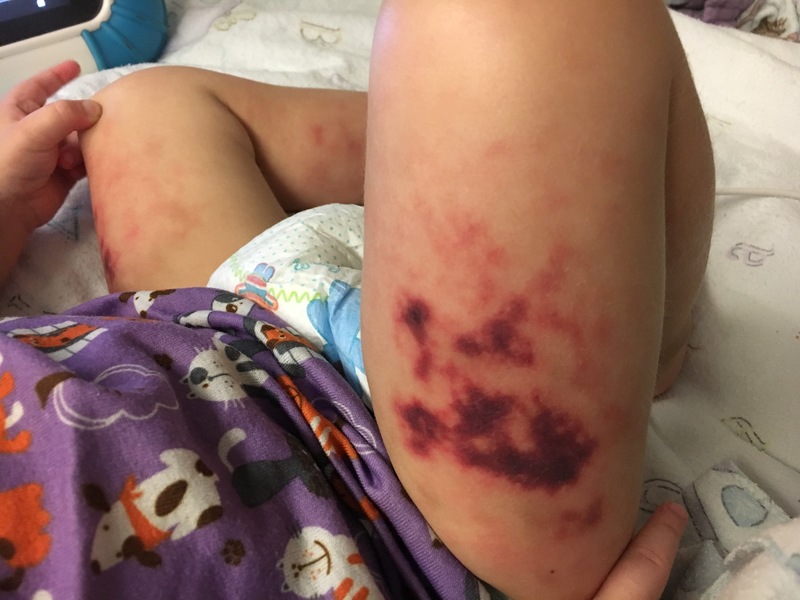 Besides pink mottled skin and dots on her legs and arms (nothing on her abdomen, chest or back) she also had swollen and purple/red knees. Then the cardiology fellow came to look just as I was turning the lights out for nap time. Everyone seemed concerned and asked if Hana was having trouble walking or standing or itching or pain. She didn’t seem any different to me. I finally got Hana to fall asleep and they showed up to do the echocardiogram. Hana never sleeps through echocardiograms. Then the GI fellow showed up and said that Hana was not ready to start any formula today and possibly tomorrow. 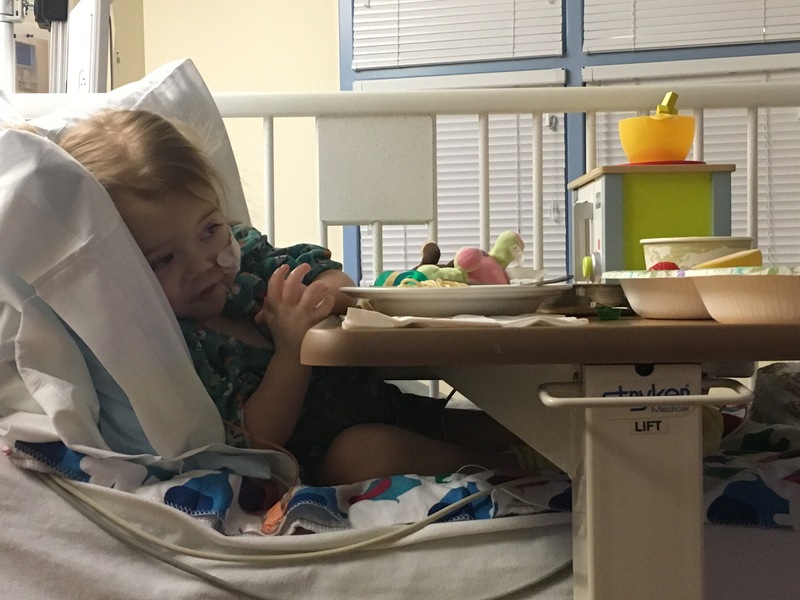 She said they treat kids who have had liver transplants for adenovirus all the time and it just takes a long time to recover. She also said we would be here at least another week. After that the heart failure/transplant fellow showed up to look at Hana’s rash. She ordered Benadryl. By the time she left, I knew there was not going to be any napping for Hana today. Later, after the Benadryl, the attending and fellow showed up and by that time the rash and knee swelling was starting to look better. The theories so far are – a delayed drug reaction to the Cidofovir, a reaction to adenovirus, a drug reaction to something else, a new infection. They need to watch and manage it carefully. They may need to pre-treat Hana with Benadryl before the next Cidofovir dose, which is tomorrow (Tuesday). I wish that were the end of it. 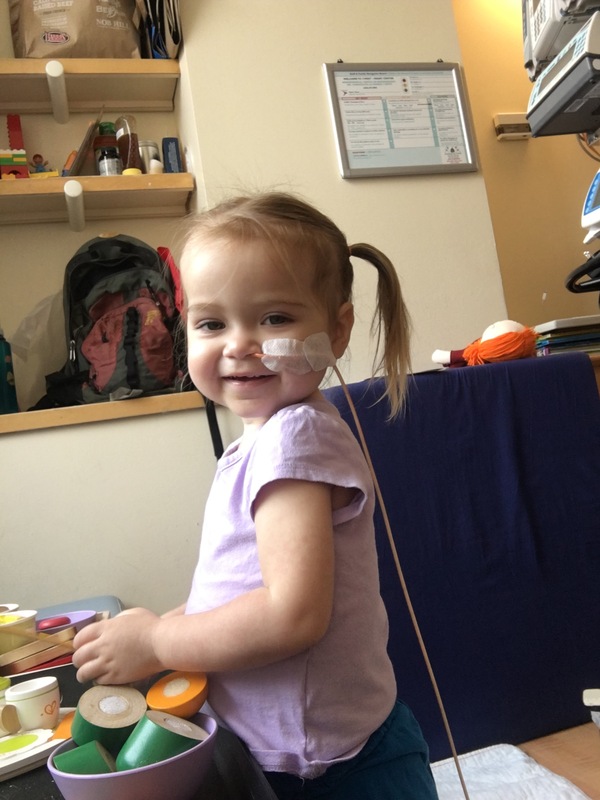 When the night nurse came in to do her assessment, Hana had a mild FEVER, 100.9. You never want to have a fever when you have lines going directly into your bloodstream because this could mean bacterial infection which can be lethal. Sigh. So then the nurse was gone for a long time, as she talked with the fellow and got all the stuff she would need. Then she came back and drew blood for testing and culture. Then we placed a bag to catch urine if Hana pees (sometimes this works, sometimes it doesn’t). 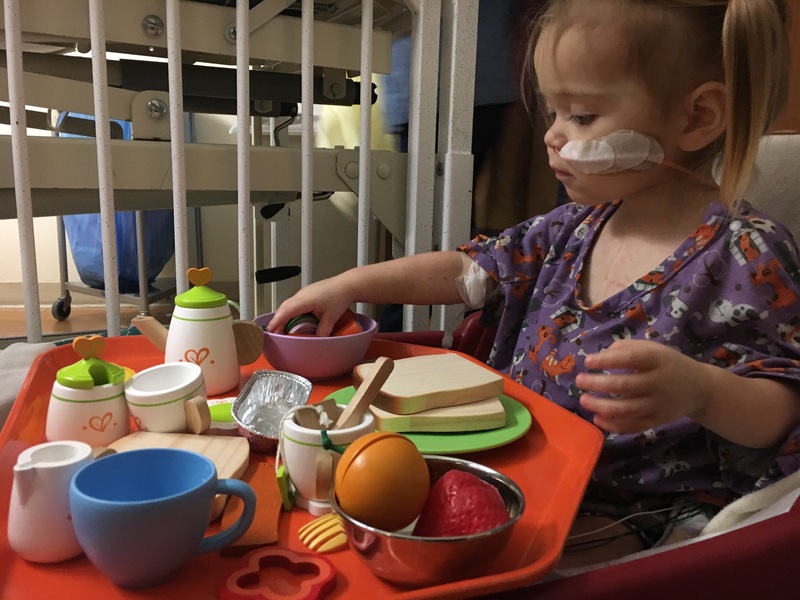 Then the new TPN and lipids (the IV nutrition) were hung up and then the IV antibiotic (zosin) was started and by the time this was all finished it was late and Hana was so incredibly tired and cranky. It is now late for me and Paul too. Luckily we already got some preliminary blood test results back and the fellow came in to tell us that so far it’s not looking like a bacterial infection. This could still mean a drug reaction to go with the rash or maybe another viral infection on top of the adenovirus. 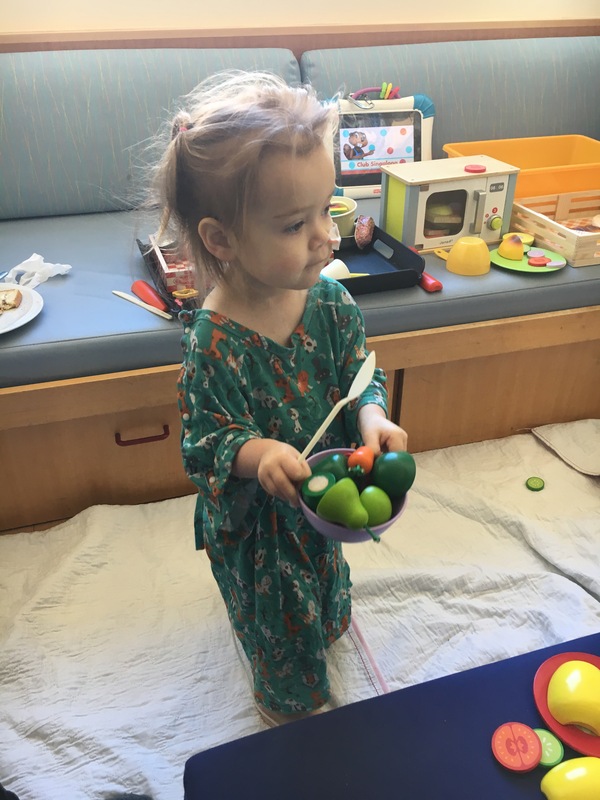 This hospital is filled to the brim with contagious sick kids right now. It’s so bad that they are having kids share rooms that they normally would NEVER have share a room. So we’ve been a little bit on pins and needles. In all of this I forgot to mention that Hana tried to eat playdough earlier in the day, she is so sadly desperate for food. She cried so hard when I swiped it away. I am both the bad guy and her comfort – how confusing that must be for her. 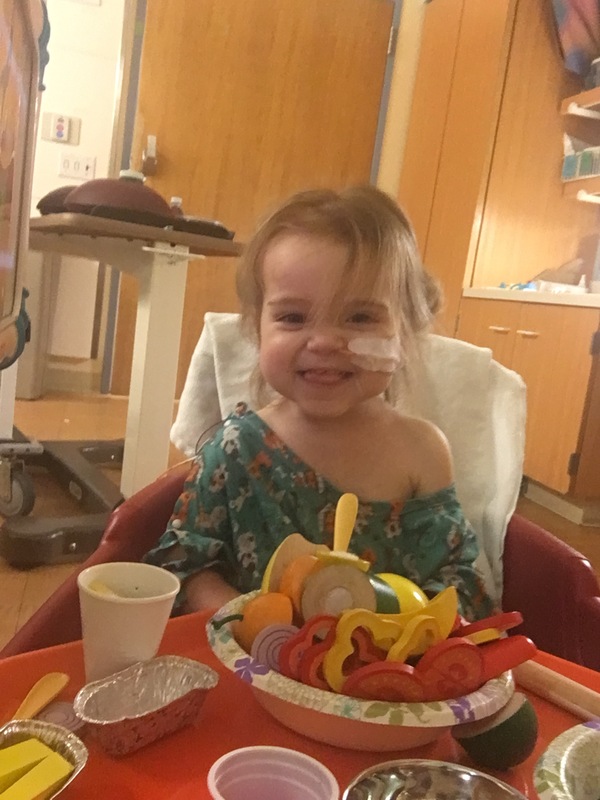 I also want to mention that a friend of ours, another little girl with cardiomyopathy and a few months younger than Hana, was admitted to the CVICU last night. She suddenly had a seizure and turned blue. She has no history nor known risk or reason to have a seizure so I can only imagine how intensely scary it was. 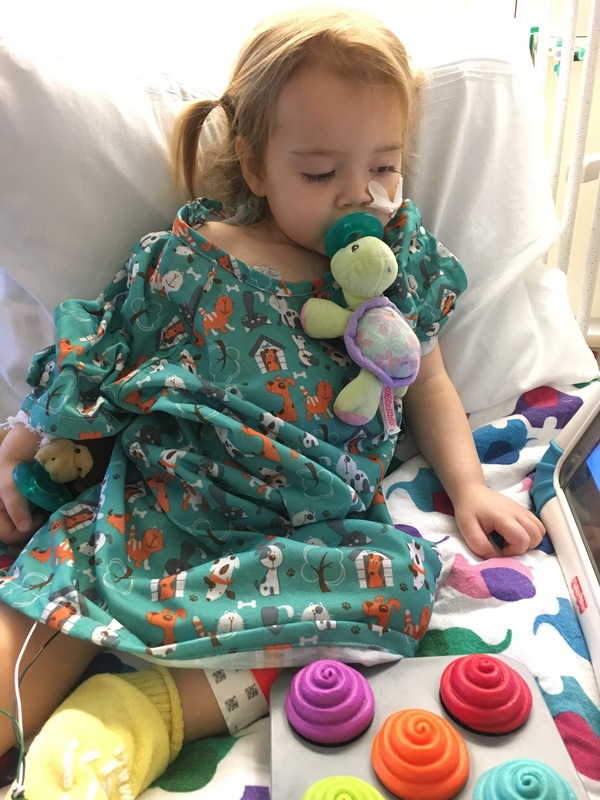 She had two more seizures, one in the first ER and another in the Stanford ER. 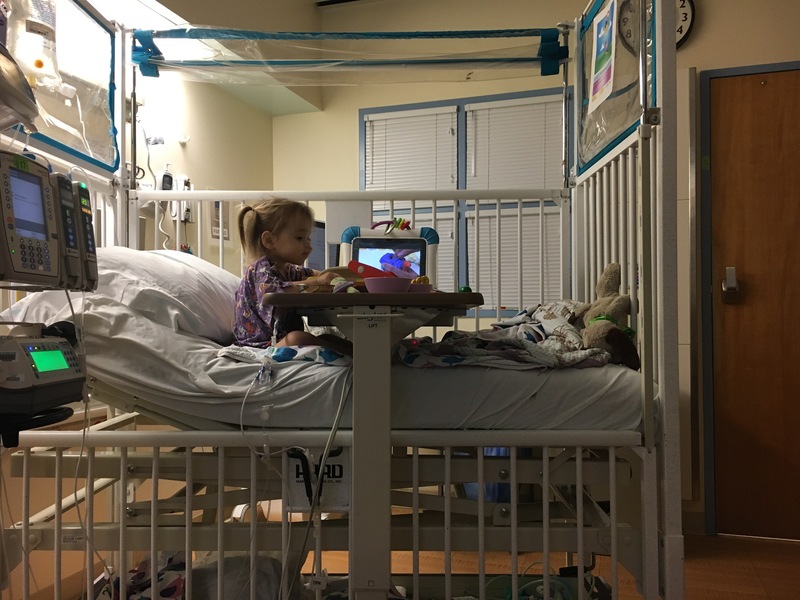 Her poor brother had to witness the intensity of the first seizure – as his parents thought they were going to lose his sister. That’s a lot for a little kid to handle. Please keep her and her family in your thoughts and prayers. Today we got two positives. I wish two positives were a good thing but when you are talking about viruses, that is not the case. 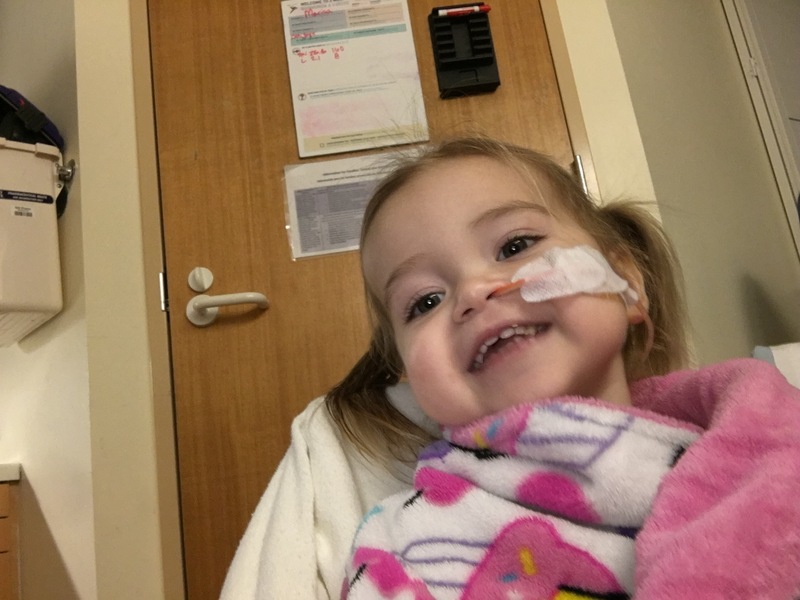 Both of Hana’s adenovirus blood tests came back for positive for high levels of the virus. The way I understand it, and I could be off a bit, her initial blood test came back at 7,000 last Thursday. Then they drew a level this past Wednesday which came back 25,000 and another this past Thursday which came back at 15,000. The cardiology fellow (admittedly not an Infectious Disease Doctor) interpreted this to mean that Hana’s adenovirus got worse after the initial test and first few treatments of the Cidofovir then peaked at 25,000. Now it is on its way down which is why the latest test came back at 15,000. I hope she’s right. This was disappointing news for us, but it makes sense because Hana’s symptoms seemed to follow the same trend. 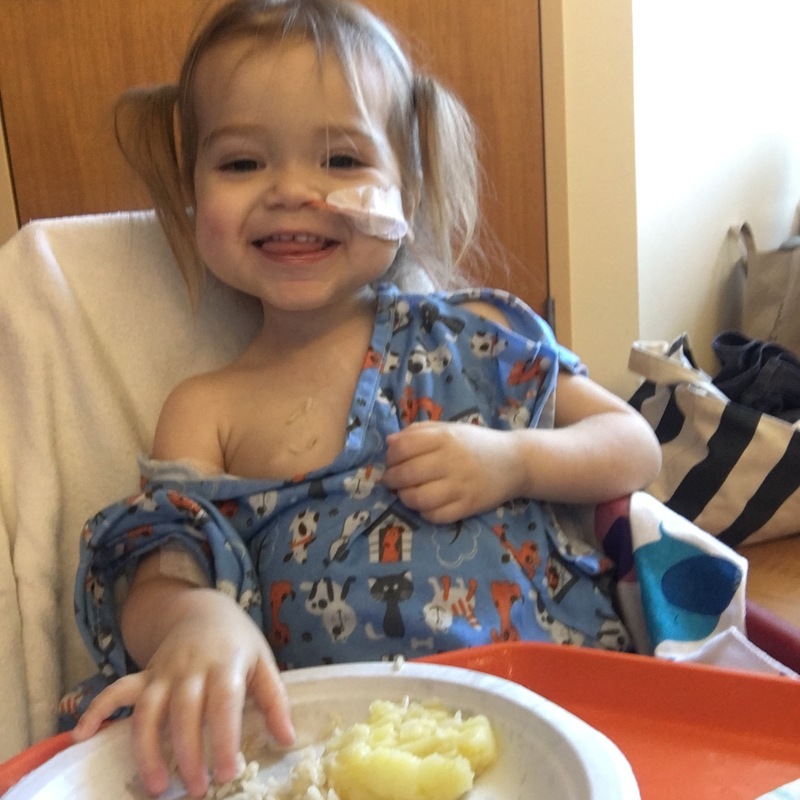 Today they started IV nutrition for Hana so that she starts to get something as her gut rests. My understanding is that GI will check in Sunday and make recommendations based on her progress. 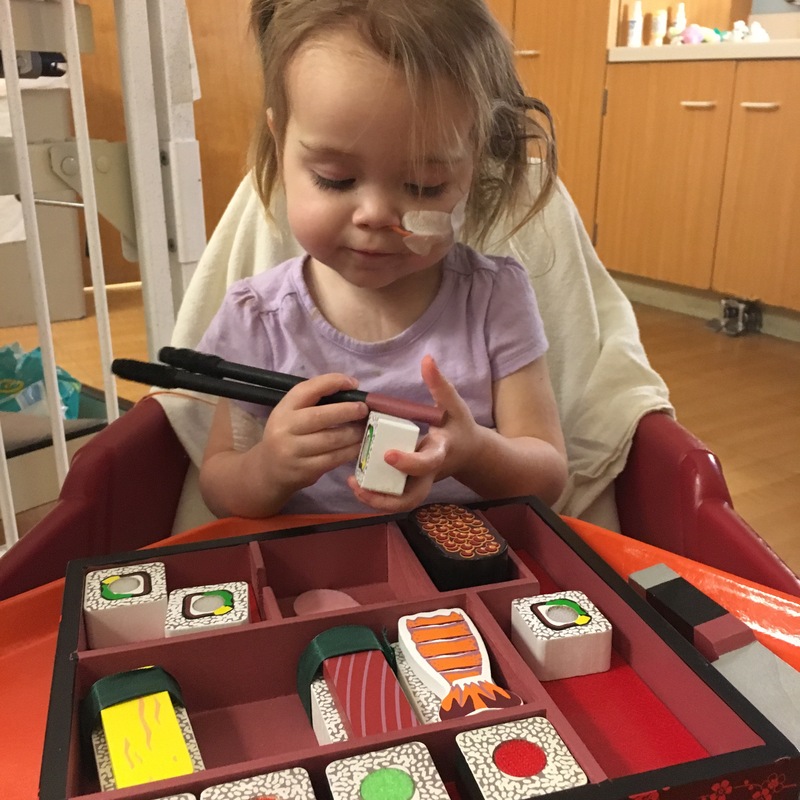 Tomorrow (Sunday) Hana will get another Cidofovir infusion. They also did another dose of IV Magnesium today. All these things started to get to me today as I worried about things tumbling out of control. 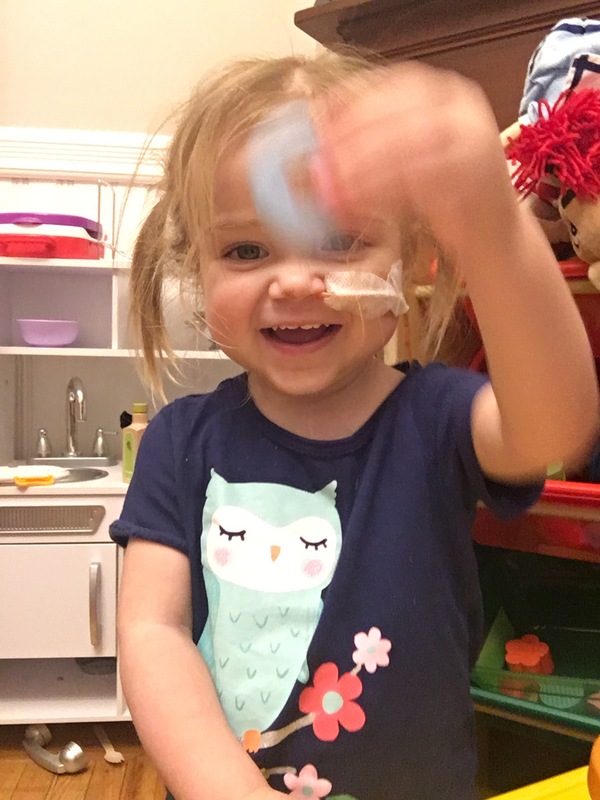 It would only take one small thing to really push Hana over the edge – another contagious infection or a PICC line infection or who knows what. I think seeing Hana feeling so down and out for so long was getting to me and I wondered if that’s how parents of kids fighting cancer feel. I was able to get out of the hospital for a bit while Paul stayed with Hana. I was too exhausted to do much or even go for a walk. But I did feel a bit better when I returned and I came back with a toy for Hana. 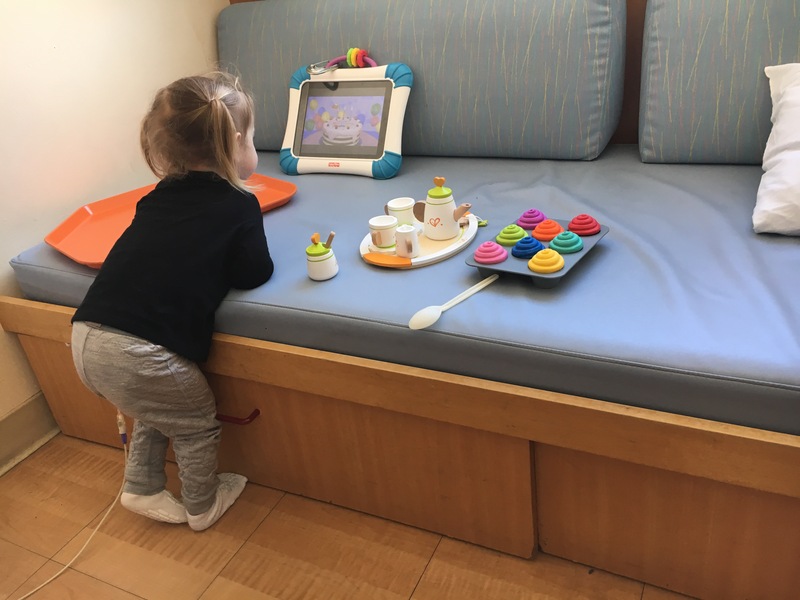 She hasn’t wanted to play with toys for many days – she’s been watching her musical cartoons on the iPad, so I was hesitant to get anything. She’s been picking songs about food. Then she started picking videos of adults playing with toy food (it’s ridiculous, who are these people?). I normally change these videos when they come on but I was desperate so I let her watch them. Besides I wasn’t able to engage her in any of the iPad apps I had downloaded for her. So, the toy I brought back was wooden toy food. She LOVED it! For the rest of the day she would sit up for short spells and play with the toy food and play dough. She would even pretend to eat it and say, “Yummy!” I thought toy food would just make her feel worse since she can’t eat, but I guess not? Hana seemed to perk up in the afternoon, overall. She even asked to have popsicles. 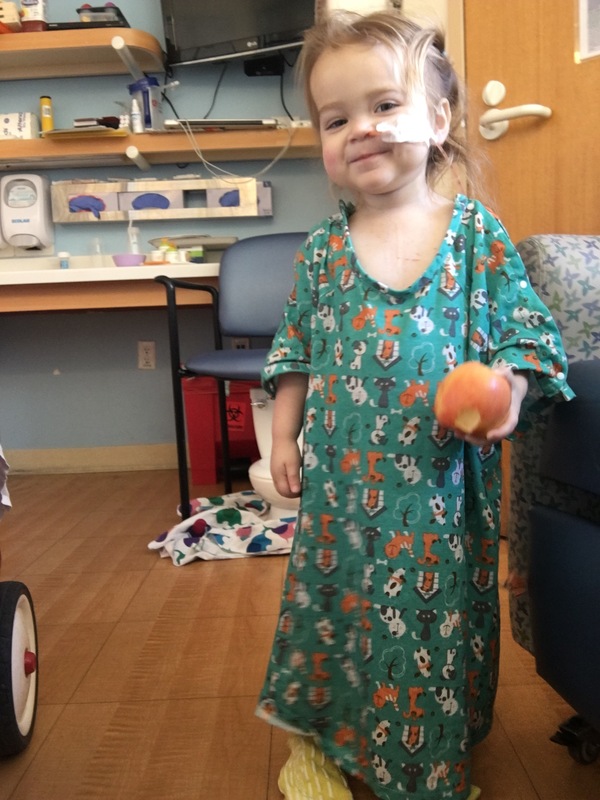 We were tipped off that the Emergency Department had Pedialyte popsicles and yesterday one of the nurses went on a mission to get some for Hana. She only wanted the blue popsicles. Yesterday we found more Pedialyte popsicles at the drug store so I got some and put them in the freezer. Still today she would only touch the bright blue Pedialyte popsicles! She only eats them in very small amounts but at least it’s something. Yesterday Hana didn’t really ask to eat or drink but today she did. It’s so hard to deny her. While I was out today, the attending cardiologist stopped by and talked with Paul. 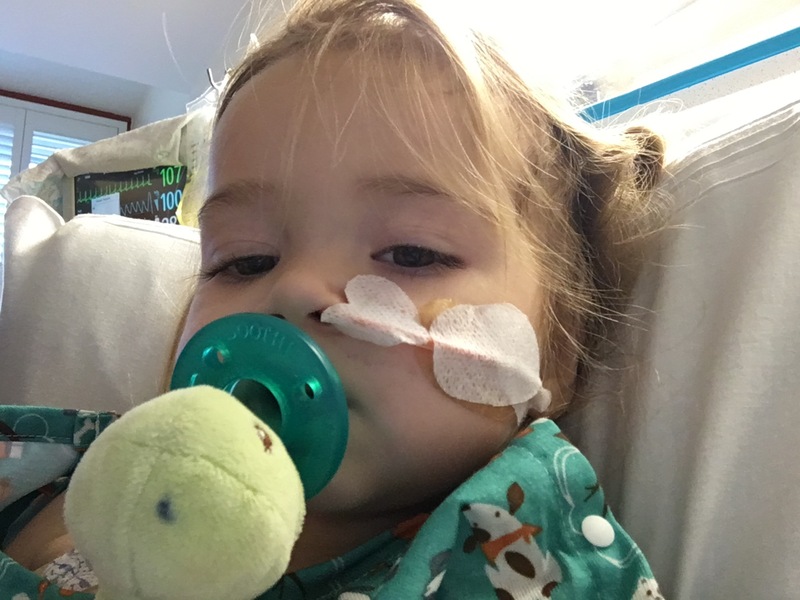 He said it is not unusual that it is taking so long for Hana to overcome the adenovirus and they usually expect two weeks of Cidofovir treatment. 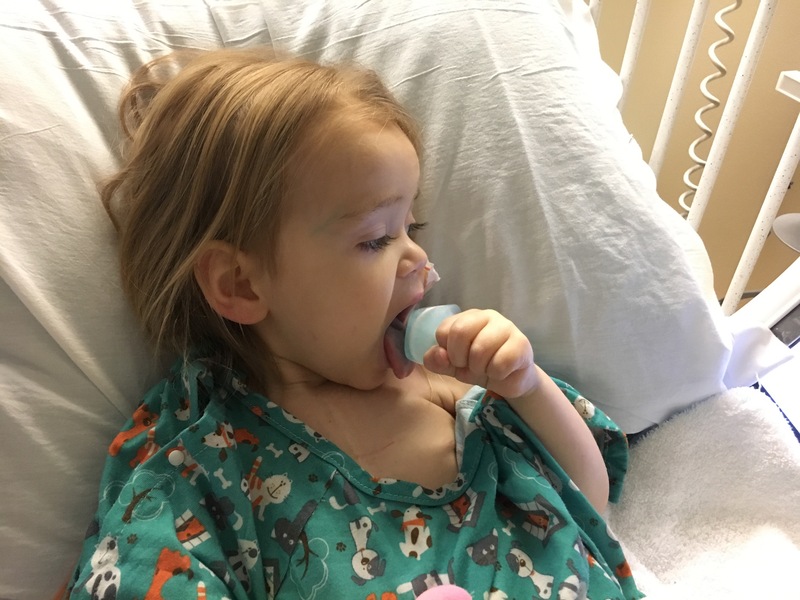 Then the side effect of the adenovirus is the GI problems and that can take a few weeks to resolve (although I don’t anticipate we would have Hana in the hospital the entire time). This all made me feel a little better. It will take more patience and the challenge of figuring out how best to nurture Hana through this.